Glucose, a monosaccharide, forms the building blocks for more complex carbohydrates. Carbohydrates are a class of biological molecules that contain primarily carbon (C) atoms flanked by hydrogen (H) atoms and hydroxyl (OH) groups (H-C-OH). Carbohydrates have two major biochemical roles. For one, they act as a source of energy that can be released in a form usable by bodily tissues. Secondly, they serve as carbon skeletons that can be rearranged to form other molecules necessary for biological structures and functions. While carbohydrates are essential for the human diet, excessive consumption of particular types of carbohydrates correlates with obesity, diabetes, heart disease, and even drowsiness. The carbohydrates found in candy or processed sugar can be very stimulating to the senses, but it is essential to use discipline in one's diet to avoid the complications of too many of the wrong types of carbohydrates. 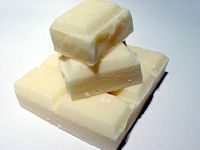 Oligosaccharides (oligo- "several") are made up of from 3 to 20 monosaccharides. The general chemical formula for carbohydrates, C(H2O), gives the relative proportions of carbon, hydrogen, and oxygen in a monosaccharide (the proportion of these atoms are 1:2:1). This formula is characteristic of sugars and gave rise to the term carbohydrate because compounds of this sort were originally thought to be "hydrates of carbon." This term persists even though a carbohydrate definitely is not a hydrated carbon atom. For monosaccharides, the general formula is (CH2O)n, with n equal to the number of carbon atoms. In disaccharides, oligosaccharides, and polysaccharides, the molar proportions deviate slightly from the general formula because two hydrogens and one oxygen are lost during each of the condensation reactions that forms them. These carbohydrates have the more general formula Cn(H2O)m.
Glucose as a straight-chain carbohydrate (Fischer projection). Glucose is an aldohexose because it has a terminal carbonyl group. The repeating units of polysaccharides are simple sugars called monosaccharides. There are two categories of sugars: aldosugars, with a terminal carbonyl group (a carbon atom double-bonded to an oxygen atom), and ketosugars, with an internal carbonyl group typically on the second carbon atom. Within these two groups, sugars are named according to the number of carbon atoms they contain. Most sugars have between three and seven carbon atoms and are termed triose (three carbons), tetrose (four carbons), pentose (five carbons), hexose (six carbons), or heptose (seven carbons). Glucose is an aldohexose, fructose is a ketohexose, and ribose is an aldopentose. Each carbon atom that supports a hydroxyl group (except for the first and last) is optically active, allowing a number of different carbohydrates with the same basic structure. For instance, galactose is an aldohexose but has different properties from glucose because the atoms are arranged differently. The single most common monosaccharide is the aldohexose D-glucose, represented by the formula C6H12O6. The carbons of glucose are numbered beginning with the more oxidized end of the molecule, the carbonyl group. The figure to the left depicts glucose as a linear molecule. In the cell, however, glucose exists in dynamic equilibrium between the linear and ring configurations. The ring form is the predominant structure because it is energetically more stable. This form results from the addition of the hydroxyl (OH) group on carbon atom 5 across the carbonyl group of carbon atom 1. A more satisfactory representation of glucose is shown in the Haworth projection. The Haworth projection is preferred because it indicates both the ring form and the spatial relationship between the carbon atoms. The tetrahedral nature of each carbon atom in the chain actually favors the ring formation of glucose. The formation of the ring structure generates two alternative forms of glucose based on the spatial orientation of the hydroxyl group on carbon atom 1. These alternative forms of glucose are designated α and β. As shown in the figure, α-D-glucose has the hydroxyl group on carbon atom 1 pointing downward. β-D-glucose, not shown here, has the hydroxyl group on carbon atom 1 pointing upward. Starch and glycogen are composed of α-D-glucose monomers whereas cellulose is composed of β-D-glucose monomers. Glucose interconverts between α-ring, β-ring, and straight-chain forms at dynamic equilibrium. In addition to the free monosaccharide, glucose also occurs in disaccharides, which consist of two monosaccharide units linked covalently. Each disaccharide is formed by a condensation reaction in which there is a loss of hydrogen (H) from one molecule and a hydroxyl group (OH) from the other. Glycosidic bonds form between carbon 1 of the first glucose molecule and carbon 4 of the second glucose molecule. The resulting glycosidic bond is the characteristic linkage between sugars. Three common disaccharides are maltose, lactose, and sucrose. Maltose (malt sugar) is made up of two glucose units linked together. Lactose (milk sugar) consists of a glucose linked to a galactose. Sucrose (common table sugar) has a glucose linked to a fructose. Although the disaccharide maltose contains two glucose molecules, it is not the only disaccharide that can be made from two glucoses. When glucose molecules form a glycosidic bond, the linkage will be one of two types, α or β, depending on whether the molecule that bonds its carbon 1 is an α-glucose or β-glucose. An α-linkage with carbon 4 of a second glucose molecule results in maltose, whereas a β-linkage results in cellobiose. Although maltose and cellobiose are disaccharide isomers, both having the formula C12H22O11, they are different compounds with different properties. For example, maltose can be hydrolyzed to its monosaccharides in the human body where as cellobiose cannot. Some organisms have the capacity to break down cellobiose. Oligosaccharides typically consist of three to twenty monosaccharide units bound by glycosidic linkages. Often, oligosaccharides have additional functional groups that give them special properties. Many oligosaccharides are covalently bonded to proteins and lipids on the outer cell surface where they play important roles in cellular recognition of extracellular signal molecules and of other cells. The human blood groups (ABO) obtain their specificity from oligosaccharide polymers. Polysaccharides are giant polymers of monosaccharides linked by glycosidic bonds. Polysaccharides are not informational molecules. The major polysaccharides in higher organisms are the storage polysaccharides starch (in plant cells) and glycogen (in animal cells), in addition to the structural polysaccharide cellulose (in plant cells). Each of these polymers contain the six-carbon sugar glucose as its single repeating unit, but they differ in the type of bond between glucose units and the presence and extent of side branches on the chains. Starch is a polysaccharide of glucose with α-1,4 glycosidic linkages. Glycogen is a highly branched polysaccharide of glucose with α-glycosidic linkages. α-1,6 glycosidic linkages produce branching at carbon 6. Cellulose is an unbranched polysaccharide of glucose with β-1,4 glycosidic linkages that are chemically very stable. Glycogen is highly branched with α-1, 6 linkages occurring every 8 to 10 glucose units along the backbone and giving rise to short side chains of about 8 to 12 glucose units. Glycogen is stored mainly in the liver and in muscle tissue. In the liver, glycogen is readily hydrolyzed to glucose monomers, which are used to maintain blood sugar levels. In muscle, glucose monomers of glycogen are further degraded to liberate their stored energy for generation of the Adenosine triphosphate (ATP) needed for muscle contraction. The reason that glucose must be stored as the polymer glycogen is that 1000 glucose molecules would exert 1,000 times the osmotic pressure (causing water to enter the cells) of a single glycogen molecule. Without polysaccharides, organisms would expend a lot of time and energy expelling excess water. Starch occurs as both unbranched amylose and branched amylopectin. Like glycogen, amylopectin has α-1,6 branches, but these occur less frequently along the helical backbone (once every 12 to 25 glucose units), producing longer side chains (lengths of 20 to 25 glucose units). Starch readily binds water, and when that water is removed, polysaccharide chains aggregate, forming hydrogen bonds. This bonding is what causes bread to become hard and stale. The addition of water and gentle heat softens the bread by separating the polysaccharide chains. Since branching limits the number of hydrogen bonds that can form between molecules, solid deposits of the highly-branched glycogen are more compact than those of starch. Starch deposits are generally about 10-30 percent amylose and 70-90 percent amylopectin. Cellulose is the main component of plant cell walls and is by far the most abundant organic (carbon-containing) compound on earth. Like starch and glycogen, cellulose is also a polymer of glucose, but the repeating monosaccharide unit is β-glucose and the linkage is therefore β-1,4. Because of the stability of its β-glycosidic linkages, cellulose is an excellent structural material that can withstand harsh environmental conditions. Mammals do not have an enzyme that can hydrolyze a β-1,4 bond, therefore, mammals cannot use cellulose as a food. For this reason, humans can digest potatoes (starch) but not grass (cellulose). Animals such as cows and sheep that eat grass cannot cleave β-glycosidic bonds either, but rather depend on the bacteria and protozoa in their rumen (part of their compound stomach) to do this. These microorganisms digest cellulose and create end-products in the form that the animal can use. The rigid linear rods that cellulose forms aggregates laterally into microfibrils. Microfibrils are about 25 nanometers in diameter and are made up of about 2,000 cellulose chains. The cells walls of plants and fungi consist of cellulose microfibrils embedded in a noncellulosic matrix containing a variable mixture of several other polymers. There are two major types of carbohydrates in foods: simple and complex. Simple carbohydrates (monosaccharides and disaccharides), also called simple sugars, are found in processed and refined sugars including table sugar, honey, and candy, and in fruits, vegetables, and milk products. It is better to obtain simple sugars from foods like fruit and milk because they also contain vitamins, fiber, and nutrients such as calcium, whereas candy does not. Simple carbohydrates are more easily digested by the body than complex carbohydrates. Complex carbohydrates are combinations of starch and fiber and include products such as bread, cereals, pasta, rice, and starchy vegetables like potatoes. Just as in simple carbohydrates, some complex carbohydrate foods are better choices than others. Refined grains such as white flour and white rice have been processed and rid of their nutrients and fiber. Unrefined grains such as brown rice, whole-wheat pasta, and oats, on the other hand, still contain vitamins and minerals, and are rich in fiber, which helps the digestive system function well, prevents constipation, and can reduce headaches. We also get fiber from fruits and vegetables (especially the skins), unrefined grains, nuts, seeds, beans, and legumes. In general, when determining whether a carbohydrate is good for our body or not: if it has fiber, it is a good carbohydrate, if it has no fiber, avoid it—it will be immediately turned into sugar by our body. Both simple and complex carbs are part of a healthy diet. 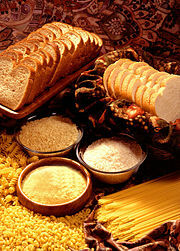 Upon the intake of carbohydrates, the body breaks them down into simple sugars which are absorbed into the bloodstream. As the sugar level in the blood rises, the pancreas releases the hormone insulin, which attaches to the surface of cells, allowing sugar to move from the blood into the cells where it can be used as a source of energy. With simple sugars, the blood sugar level rises more quickly than with other sugars, and the body is more likely to feel hungry again soon. When this process occurs more slowly, however, as with whole-grain food, the body is satisfied for a longer period of time. Scientists have been studying whether eating foods that cause big jumps in blood sugar are linked to health problems such as diabetes and heart disease. Although humans, like most mammals, can convert the amino acids of proteins and the glycerol of fats to glucose, it is still important to have carbohydrates in the diet. Excessive carbohydrates and a high caloric intake can cause obesity; however, a diet deficient in carbohydrates also is not healthy. Low-carbohydrate (low-carb) diets are based on the idea that a lower intake of carbohydrates leads to a reduction in the body's insulin production, resulting in fat and protein (muscle) stores used as main energy sources instead. Proponents of low-carb and "good carbs" diets, including cardiologists Robert Atkins and Arthur Agatston, maintain that in addition to weight loss, such a diet is good for cardio-vascular health. Detractors maintain that while some effectiveness in weight loss is evident, in the long run such diets may not be advisable because proteins and fats are vital building blocks of the body's tissues and cells and thus should not be depleted by use in energy production. Additionally, a shortage of carbohydrates causes the body to revert to a process called ketosis, wherein a person produces ketone bodies to fuel parts of the body, such as the brain and red blood cells that cannot use fat as an energy source. Ketosis is characterized by smelly breath (an acetone smell like nail varnish) and side effects such as nausea and fatigue. Furthermore, detractors claim that very low carbohydrate diets can slow down brain and neural function because the nervous system especially relies on glucose. Low-carb diets are definitely not recommended for athletes or those that participate in high-intensity activities because a lack of glycogen stores in muscle tissue leads to considerable reduction in performance. Based on evidence for the risk of heart disease and obesity, the Institute of Medicine recommends that American and Canadian adults get between 40-65 percent of dietary energy from carbohydrates (Food and Nutrition Board 2002). The Food and Agriculture Organization and World Health Organization jointly recommend that national dietary guidelines set a goal of 55-75 percent of total energy from carbohydrates (WHO/FAO 2003). The Glycemic Index measures the speed at which particular carbohydrates are converted into glucose in the body. Because simple sugars convert quickly, they are rated higher on the glycemic index. Foods high in fiber, on the other hand, take longer to convert and are low on the GI scale. Overwhelming the body with simple carbs or foods high on the GI causes it to secrete too much insulin, throwing off the system's homeostasis and leading to disease. Dowshen, S. 2005. Learning About Carbohydrates. Kid's Health. Retrieved August 10, 2015. King, M. W. 2006. Monosaccharides Biochemistry of Carbohydrates. Retrieved August 10, 2015. Vitamins-Minerals-Supplements.org. Carbohydrates-Food sources and low carbohydrates diet. Retrieved August 10, 2015. This page was last modified on 10 August 2015, at 15:52.